do you have any plans for a torus shaped house? i’ve always dreamed about such a home. primarily i like this idea for the open courtyard/garden at the center of the home. Not yet, but I am planning one eventually. It’s a great concept. Love this plan! A question though- where the earthberm comes in contact with the earthbag walls, would there be a need for a moisture barrier as often done with traditional earthbermed buildings? Yes, I recommend two layers of 6 mil poly sheeting: one layer directly against the earthbags; the second layer at a 45-60 degree angle. This is shown in the wall section that comes with the plans. Thank you Owen! When earth-berming earthbag structures that are not curved would there be design considerations for buttresses on both sides of the bermed walls? Berming means to slope earth against the building. Usually the earth is only 2′-3′ high. This would not require buttresses. Use 6 mil poly (plastic sheeting) so water drains away from the building. So if one of the bermed earthbag walls was not curved but straight and longer than let’s say- ten feet, it would not require a buttress on either side? No buttresses are necessary if the earth is only bermed 2′ or so. This assumes the first 2 courses are in a gravel-filled trench (rubble trench) to help key the wall into the earth and there’s two strands of barbed wire between all courses. Tubes are stronger than bags for this application. Is it possible to berm the house on three sides further up the walls. Would it hold structurally? I would like to have a green roof and this design bermed at least 6 feet on three sides. Just wondering if it’s possible. Yes, this plan uses 2′ wide earthbags with rebar pins through the bags. Thank you! I really enjoy your site. My wife an I are searching for land to build very soon! When that starts I’m sure I’ll be bending you ear more frequently. Thank you for you speedy response. 2′ wide? that is very wide! and with rebar? wow. why so thick with reinforcement? That’s the wall that retains the earth. Earth sheltering puts enormous forces against the walls. I absolutely love this floor plan. How difficult would it be to add a root cellar behind the cold storage through the “future” door, expand the kitchen for a homestead with a lot of cooking on a wood stove and add a washer dryer hookup without losing the hope and feel of what you have here? I’m thinking a good size cook stove would eliminate the need for the masonry stove ($$$) and heat the small home effectively in mild Tennessee winters. No problem with the root cellar. As far as the rest, try not to move the earthbag walls or fireplace. The roof plan took a lot of work and would need to be redone if you move the main walls. The masonry fireplace supports the roof, so you don’t want to move or delete it. Also keep in mind that this home is small and energy efficient. A wood cookstove would almost drive you out of the house unless you live in Canada. Instead of moving everything around, I would add on a roundhouse or some another structure next to this one so you have extra space for your needs. Thanks so much for that information. This plan has almost every feature on my wishlist so the idea of adding a roundhouse or two seems the perfect solution. How often will the exposed exterior walls need to be resealed? Is it practical to cover them with some kind of stone or brick to lower the maintenance? I’m just thinking as I grow old, I’d like to have it be low maintenance. You can look through my other plans and see if you find something you like. Many clients combine multiple small structures in creative ways. Then I can combine them and work out the final details for a custom plan. Email me when you’re ready. Exterior finish: A lot depends on the quality of the workmanship. It would probably pay to hire a pro to do the plastering to make sure it’s done right. Someone with 20-30 years experience obviously knows a lot more than a novice. And the cost should be reasonable since the house is small. Plus a lot of tradesmen are short on work nowadays. You could use brick on some of it. Recycled brick is a good choice. Using all new brook could break the budget. Thanks again for answering my questions! I’ve also really been enjoying your how-to videos and articles on MEN and YouTube. I think, since we will be living in an old RV while we build, I will build the root cellar in your plans first for a storm shelter/ root cellar for safety during tornado season as well as practice with the building techniques. That’s what we always recommend — start small, develop your skills and then decide if earthbag building is the best choice for you. 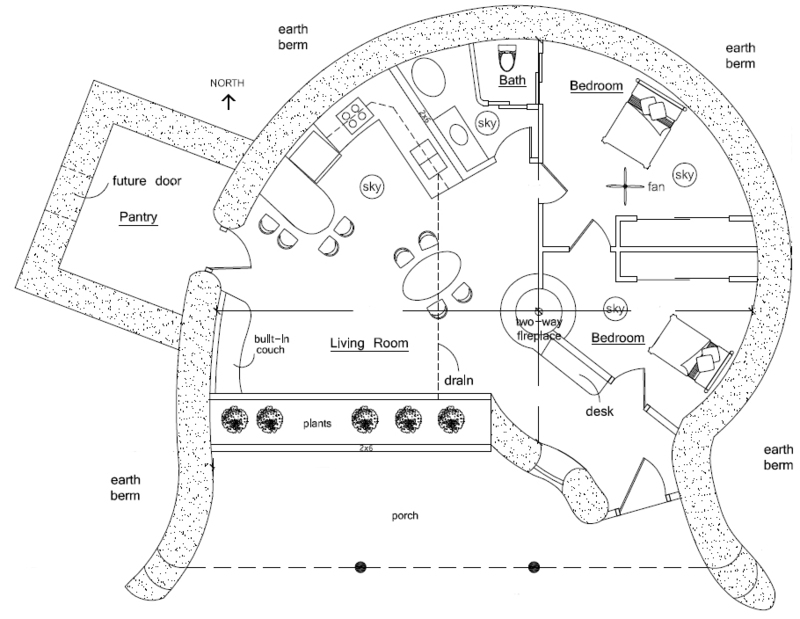 i love this plan and i want to build it, but with a green house in front ( for jacuzzi and partying. tell me one thing : how do i build a roof from earth bags and not wood, with one roof window and a solar chimney? You’d have to build a dome [or use ferrocement — see below]. That’s the only way to build a ‘roof’ with earthbags. But the structure must be round. Odd shapes (spirals, rectangles, etc.) won’t work because the forces will not be evenly distributed and the roof would collapse. One alternative is to use rebar to create the desired shape (spiral, free form, vault, etc. ), add ferrocement and then insulation (possibly insulated earthbags, foam, etc.) and then waterproofing. There’s lots of information about this on our blog if you search for the keyword ‘ferrocement’. It’s a fascinating building method that’s so strong you can build ships with it and they’ll last decades. what structural changes should be made in this plan? outher walls, inner walls? what slope of the roof? what kind of bags? maybe endless bags??? Hello. What do you mean by changes? Changed from what? Outer walls are earthbags. Inner walls (interior walls) are 2×4 or 2×6 typically. You could possibly use poles or wooden pallets in some cases (if no codes). You can adjust the slope of the roof to match your climate. You want enough slope for drainage, but not too much. You can use standard polypropylene earthbags, raschel bags (also called mesh bags), poly tubes or raschel mesh tubes. All will work. Find out what’s available locally at the best price. Our Natural Building Blog and EarthbagBuilding.com sites have over 1,000 pages on every aspect of earthbag building. Use the built-in search engines to find whatever topic you want (ex: raschel). i was reffering to your “spiral house 2 “plan. i am a little consired about dome because i want to put about 4-5 feet (120cm) of earth on top of the dome to provide annual energy storage (pahs). You’d have to get it engineered and build the roof with steel or steel and concrete. The roof would probably cost more than the whole house unless you could find recycled steel at low cost. Even then, it would be difficult to build. How high are the ceilings and does the design account for electrical outlets? The high point of the ceiling is 12′. Electrical drawings are not included to keep cost of plans affordable for an international audience, and because codes vary from area to area. Local electricians will know where to put outlets, etc. no problem. Do you think this plan would be good for northern West Virginia? I really like this design,but could it be done with cordwood? Earthbag is superior for building below grade such as earth sheltered walls. Use cordwood on other walls.